Called Griff by his friends, he mostly praises Plue and calls him 'Master Plue'. He looks like a strange blue blob, with eyes and arms. 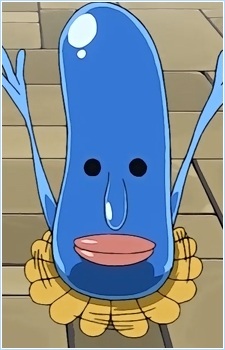 He is close to Plue in size but with the ability to speak. Griff has limited shape-shifting abilities; such as inflating portions of his body and elongating his limbs. He is also a voyeuristic character, and in a couple of episodes he is seen spying on Elie. He is the cartographer of the group. He has been described as a pervert.